Worlds Fastest Motorcycle PERIOD ! ! ! Personally, I think the term "motorcycle" and "bike" needs to be re-defined. I also thought I was gonna read about or see a street bike doing insane speeds!!! 500 HP Busa engine probably wouldn't go much, if any faster. While Many may not remember, Terry Kizer put up almost 500 HP numerous times in the mid to late 90's with a zx-11 powerplant. Back then the motors may not have been able to stand up to a top speed run, and if my memory serves me correctly, he cracked a wastegate or header one year while on the dyno, but still, he made almost 500 ponies with zx-11 technology like 6 years ago. He has been making HUGE power for many years more than most any other players have even been in the turbo game. There may be better systems available now, but no one has been around and pioneered as much as Terry Kizer, as the record shows. Any day on a motorcycle like this that ends just needing parts and labor is a good day. I thought that when Terry made the 499 hp that was with Nitrous and turbo..
PS. either way he is doing great..
First sidecar over 200mph @ 218+ also the fastest ever record! Fastest NAKED record El Mirage @ 240+ come get some! Fastest bike ever at ELMO 240.197 "NAKED BABY"
Did I hear the worlds fastest is a Kawasaki????? i have VIDEO of a streamliner, just like that one, from last years racing laying around here, let me see if i can find it. Or maybe I used your camera? That is correct. On a side note, are you allowed to run nitrous on a fuel bike for land speed, using the nitrous as "fuel"?? So, what does the rudder do and how is it controlled? My guess is it helps during low speed steering and/or to help get it upright off of the skids . I'm thinking it is there to aid countersteering. Countersteering works by steering the contact patch out from under the bike's center of gravity causing the bike to lean over and turn. On a bike with such a long wheelbase this process must be pretty slow. The rudder could help tip the bike and cause it to turn. Sure would take a bunch of experimentation to get this right. All that is just theory. Maybe also helps in crosswinds? How about cause everything fast has wings???? I don't think that bike is going to do much leaning over or turning at 300+ MPH. I believe it is to steer with much like a plane, but I am just simple folk! Re: Worlds Fastest Sit On Motorcycle PERIOD ! ! ! Re: Worlds Fastest Motorcycle PERIOD ! ! ! Have a Harley, spent lots of money on it, thought I had a fast motorcycle, bought a Busa, realized all I had was a fast Harley, not a fast motorcycle! 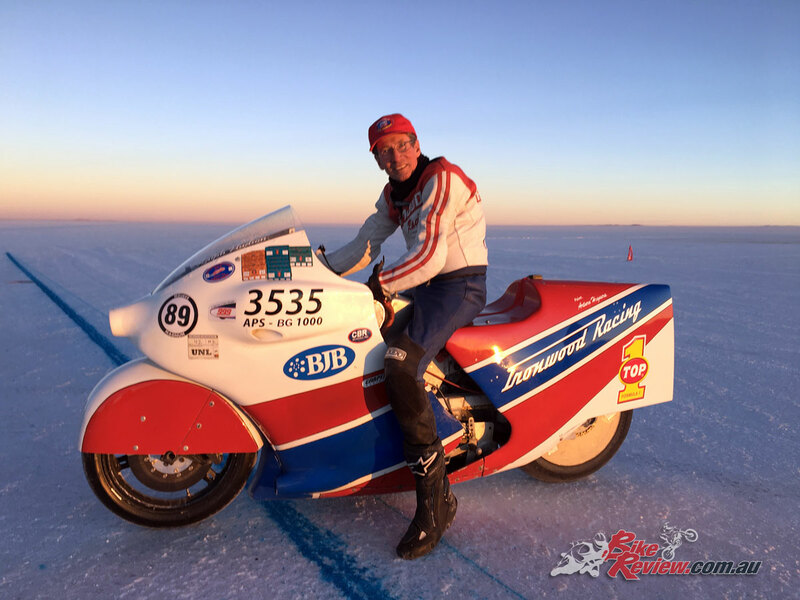 Bill Warner did 311.94 mph on an open cockpit Busa. Follow the crowd and go no where.